'Rat Film': Superb, Formally Inventive Documentary Smells A Rat — And It Is Us The film examines many facets of Baltimore's social and political history "to drive a pointed, deliberate argument that is still firmly rooted in artistry rather than political message-making." Rat King: Harold Edmond goes to work in Rat Film. Shh. Listen! Hear that faint scampering sound outside your window? The pitter-patter of tiny paws and huge, undiscerning appetites? The screech of a potential disease-carrier? Do you live in a city? It's probably a rat. But try to resist the urge to freak out, fellow citizen — at least until you watch the superb new documentary Rat Film, and can determine for yourself who between us is the true parasite of society. Whatever you think Rat Film is, it's not that. Baltimore-based director Theo Anthony has not made some grotesque subterranean portal into the world of rat infestations (that movie, Morgan Spurlock's Rats, came out last year, if you really need to watch a parade of unfeeling monster rodents getting whacked). 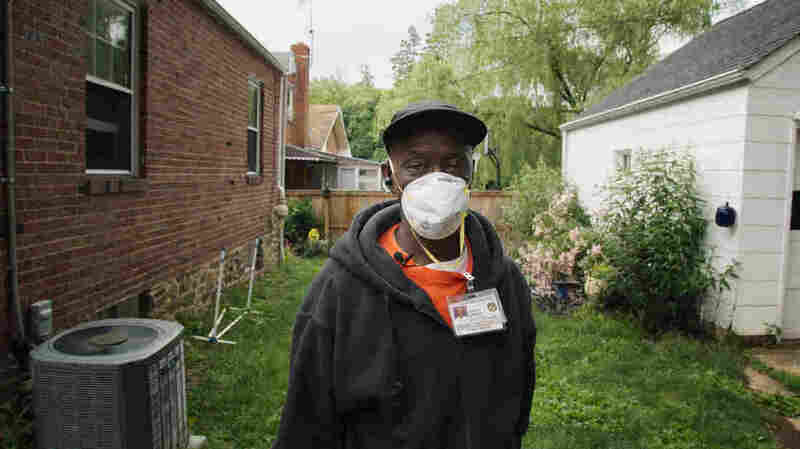 He has, instead, crafted a thoughtful, dialectic essay about Baltimore, and urban centers more broadly, showing how one city's efforts to do something like control its pest problem can illuminate its government's impersonal, even inhumane, approach to its own people. All this from one night-vision image of a rat trying to jump out of a trash can that has been designed to be just big enough to contain it. "Ain't never been a rat problem in Baltimore; it's always been a people problem," a subject says on film. And so, the narrative thread is Baltimore's efforts, beginning in the 1930s, to eliminate its rat population by any means necessary. At first the solution is mass killings, so a local scientist invents the first-ever rat poison. Only later, once the poison encourages the hardened rats to breed more, do officials switch tactics to attempt a social improvement of the city's living quarters. This approach, as one memo from the time notes, has the benefit of making life more tolerable for humans, too, although that is an unintended side effect of the rat bloodlust (the film has a bitter sense of irony). In the modern era we meet some "rat fishermen," who stick meat and peanut butter on the end of a fishing line and cast it into alleys, as well as a bonafide rat hunter, who stands guard in his backyard with his gun collection and becomes positively giddy when he spies a rat twitching, as though he's just caught sight of George Clooney. Though we see many rat deaths, we're not being instructed to shed a tear for them as much as we are asked to ponder their social status as vermin, the plague-carrying vehicles of all society's ills. In the film's final stretch, Anthony lays out the connection between rats and redlining, the historically ubiquitous government practice of denying home and business loans to people living in majority-black neighborhoods. The language used by 1933 Baltimore city officials to decry these spaces ("infiltration of a lower-grade population") was virtually identical to the way they framed the city's rat problem, and it's hardly a shock when the film overlays maps of current Baltimore unemployment and mortality rates on top of the redlining maps from 80 years ago. At the time, Baltimore officials thought they had one type of "people problem," when in fact they had another. The infuriatingly young Anthony was formerly a foreign correspondent in the Eastern Congo. Rat Film somehow manages to combine the rigors of good journalism (detailed descriptions of government policy and scientific experiments, placed into illuminating context) with a formal structure that is about as far from journalism as you can get. Rat Film incorporates poetry, video games and visual art into its editing, with a spine-tingling voiceover by Maureen Jones. Like its star critters, the movie scurries through the underbelly of its city on an unpredictable path, zigging where one might expect it to zag. It detours, tantalizingly, into the history of a bored socialite who designed intricate crime-scene dioramas for the local police department to practice their unexplained-death detective work. Peering into these bloody tableaus, or gliding through a 3D computer simulation of Baltimore and glitching our way inside buildings, we may wonder how we wound up so far away from rat-land. But the magic of the film is that it's all rat-land, because a city is a big, grimy hub of activity laid on a foundation of centuries-old prejudices, and the dark corners where these critters live may offer the purest view we have on these social contradictions. In short, Anthony is doing what documentary filmmakers rarely have the courage to do, which is to use his assembly of footage to drive a pointed, deliberate argument that is still firmly rooted in artistry rather than political message-making. Rats may be pests, he argues, but biologically and spiritually, they are not so different from us. That means we have some explaining to do.